Here are the top 8 lists from US Nationals. I'll edit in my thoughts later on. **EDIT** I've edited in my hot takes. Biggs was actually on the ground, so I'll leave it up to him if he wants to add his own thoughts later. **EDIT #2** Fixed a couple errors (three Ackbar, not four) and added the final standings. Congrats to Matt! **EDIT #3** I got a hold of Daryle Winter's list, the winner of Heat 2 that couldn't make the Finals. He would have replaced Sean Sundberg had he been able to stay. I also added some final thoughts. A classic Ace Hole. As of writing this, Matt and Ron (below) were at the top table. The squadron wing is clearly intended to dominate the squadron fight and then turn to bombing. Yavaris+Relay is in full effect here. There's nothing really new about this list. It's frustrating to see Rebels still mired in to massed flotillas for squadron heavy play, but what else is there to do? Yavaris is a huge force multiplier and the Rebels have nothing that competes with flotillas for squadron activations. I find myself able to tag out two Gozantis in favor of a Quasar for Imperials because of Flight Controllers, but Rebels don't have anything to compete with their flotillas in that regard. I can't blame Matt for going for the obvious efficiency, as distasteful as I find it from a thematic perspective. Biggs Note: Part of the Heat 2 - 3 way tie at 37 points. Did not really see it played, so can't say much more than what Truthiness already said. This list was a little blurry, so sorry if I got some details wrong. This is the first of four three Ackbar Defiance lists that feel pretty similar. Take a supped up Defiance. Make sure it doesn't die. Take 1-2 support combat ships. Fill out the rest with flotillas. I would guess that Ron here is the most aggressive of the Ackbar players. His bid screams first player, which would help cover his lack of squadron cover. Pretty much the same list Sean has been running for a while, with a minor variation in his squadron mix. He's unique among the Ackbar players in taking an MC30. Not a whole lot more to add. I know he flies it well, so it makes sense he would default back to this build for a big tournament. Biggs note: Snuck in as #4 on Day 1. I'm not entirely sure I saw him play on Table 1 or not. I like that he has the MC30 as a second combat ship. I hate Hammerheads, but I love the audacity of this list. Playing this probably feels like strapping a saddle on a rocket: flying by the seat of your pants with your destruction a small mistake away. At least that's what it looks on the surface. In practical reality, I'm guessing it's extremely efficient. Those Hammerheads don't give up many points, and the External Rack damage will pile up quickly. Biggs Note: I never got hammerheads to work for me, so good on Josh for making them sing! Probably my favorite list to see make the cut. I watched him win on Table 2 on Day 1, but sadly that just earned him #3. What is actually more deadly than all those Hammerheads is an absolutely crazy 7 squadrons of Rogue fighters that not only win the squadron game but can switch to anti-ship work after. 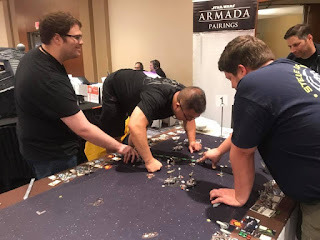 What surprised his opponent in Round 5 was him actually deploying his squadrons ON A ROCK with Fighter Ambush and going to town on an awkwardly deployed Liberty. Starting to see the pattern? Dan takes a squadron heavier approach. Don't let the number of squadrons and the points invested fool you. I've seen Dan play this list on a number of occasions. He doesn't necessarily go for a straight up squadron win. He's mainly geared toward strategic shenanigans, which he does quite well. MAKE IT STOP ALREADY!!! Oh hey, this is Rieekan instead of Ackbar. I've played lists like this myself, so I can see how this was successful enough to get into the top 8. I'm surprised that such a heavy squadron compliment didn't opt to go for heavier Strategic given he probably preferred second player with Rieekan. Based on pure numbers at the top, Imperial players seem to have a right to complain. Stephen has one of only two Imperial lists in the top 8 cut and he's #7 as of this writing. It does go to show, however, that low activation counts don't necessarily mean a list is doomed to fail. The squadron mix looks quite potent. I'm surprised to see him at the bottom of the top 8 (as of this writing). I've seen him fly this list and he does it quite well. He usually prefers to straight up win the squadron fight rather than play a delaying action from what I've seen, so my best guess is he got paired against Ace Holes and got beaten in the squadron fight early. Ackbar again, but an even odder take. Once again you have what you could call a squadron heavy list that is geared not really toward bombing, but more toward strategic shenanigans. While Yavaris is more vulnerable on the sides than a TRC90, you don't necessarily lose firepower since both ships only have a single red on the sides (I'm just talking raw number of dice, not the reliability that TRCs give). What Daryle gives up in the ship to ship game, he gains in those sweet sweet Yavaris double taps. Like the others with heavy strategic, it looks to me like his strategy is flexible in the squadron phase. Win if he can and Yavaris bomb with Gold and Dagger squadrons. Delay if he can't and do strategic shenanigans. I much as I absolute detest Matt's four flotillas, I also like being right. Rieekan Aces is still able to be at the top even post nerf. I'm very curious to see what his match ups were. I have a feeling if he ran into something like Biggs' Sloane he would have struggled. If he did and muscled through, then it tip my hat to him in a major way. It's nice that the Ace Holes wasn't as dominant, though. Then again, they never really have been around NOVA. We've been heavily Ackbar and Cracken slanted for a while now. Overall, I'm having a hard time taking lessons for the wave away from these top 8. Most of that top 8 are staples at tournaments around NOVA. They're all damned good players. They've also been playing versions of those lists for a very long time. More than anything, this tournament shows me that good players don't like to change things up for major tournaments. 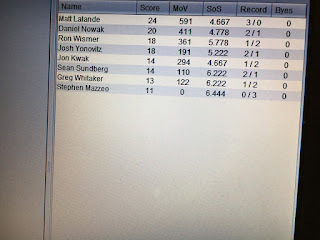 I played Dan in a Store Championship a couple weeks ago where he was flying Sloane. He defaulted back to his usual Ackbar for this because he hadn't tuned that Sloane list to his liking. Jon Kwak has been running that three activation Decimator ball for pretty much all of Store Championships. He went back to his Jerry double ISD. I don't think I've ever seen Sean run anything but Ackbar MC80+MC30. Comfort with a list is a big thing in this game. A part of me wonders what the percentage of each faction was playing. Were rebels or imps more favored as a whole? 32 ISDs for 59 players. As Eric said, only 6 Rebels out of 25 players on the first day. In Heat 1 I believe they said there were only 6 Rebels. It was ISDs as far as the eye could see, from my view. If US Nationals followed traditional Cut Rules, there would have been Top 2 Each Day (Kwak, Dan - Heat 1) and (Daryl, Stephen - Heat 2). Daryl dropped so Matt sorta owes Daryl a beer in a sense! Oh, Matt definitely earned his win... just proves that Rieekan Aces is consistent. So, this is another tabletop game that netlists/netdecks it's way to the top tables? What happened to the days when you could take anything and still compete? Skill representing more than a dominant point efficient list. I weep for todays game choices and miss yesterdays tactical options. Those aren't netlists. 3 of those folks running Defiance are folks that have been doing so for a long time in NOVA. If anything they created the netlists. The winner has been doing a similar thing with Rieekan for a year now too. UK Nationals will be an interesting counterpoint to this. I can also guarantee you won't see a Defiance build near the top. 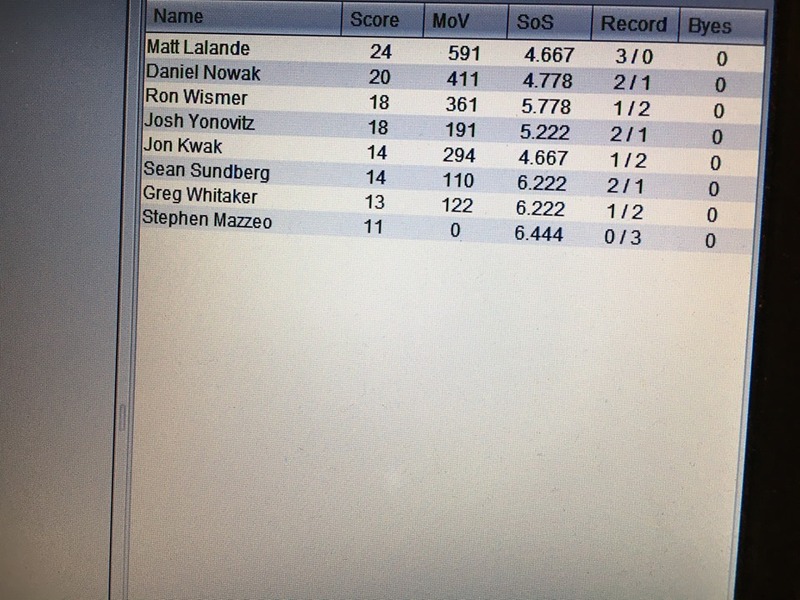 No netlists at the top in Armada. Only choices. And way less obvious choices than any other game I´ve ever played. Some of these are definitely VERY influenced by avenger bts, mkIIs are for example totally out of the game now because of it, but still, meta is always surprising. Have a look at Nationals elsewhere, you´ll find an altogether different meta. Hell, here in Spain the Madrid meta is nothing alike the Valencia or Barcelona meta. Talk about variety. I say it's a 70/30 edge for players that have mastered their list in a mirror match. Kwak steamrolled ISD builds in Heat 1. Any idea when you'll make another post? That's called copy paste :) Thanks for the catch!